42 The Journal of Commerce | December 10 2018 www.joc.com Beneath the Surface Gary Ferrulli 2018 CAME INTO the carrier's world like a sacrificial lamb, first-quarter results showing significant losses primarily because of the failure of carriers to charge for rising fuel costs. They continued the error by extend- ing the no-fuel surcharges to many favored shippers in the 2018-2019 trans-Pacific service contracts. In the third quarter, carriers began to evoke some fuel surcharg- es, started controlling capacity, and raised spot market rates to more than $2,500 per FEU to the US West Coast and over $3,400 per FEU to the East Coast. Although those rates are what they rarely are — full cost recovery plus — they still don't apply to most of the freight on relatively full ves- sels, because those are protected by the "friendly" service contracts. Recent available financial reports indicate there has been some improve- ment in the carriers' bottom lines, with some still losing money albeit at lesser amounts and some reporting profits. While we in North America generally focus on the trans-Pacific and tend here to forget the other ma- jor trades, in the Asia-Europe market, the carriers not only failed to capture the fuel increases during the first half of the year, but they also didn't manage capacity in the same way as in the trans-Pacific and their spot rates decreased. There were actions to manage capacity in the past few weeks, but the horse left the barn months ago. And container lines already have announced capacity drawdowns for December. This offers an interesting view of the same carriers in two marketplac- es taking different routes, one trying to rescue what was turning into a financial disaster into a modicum of success, the other ignoring virtually the same conditions and dragging down the gains in the trans-Pacific. It makes you wonder about carriers' decision-making processes. According to Drewry and other industry analysts, the industry for 2018 will end up at a slight loss — Drewry says about $200,000. This follows 2017, which was the first year of profitability since 2010. The anticipated year-end losses are bet- ter than expected, however, fol- lowing poor results of the first and second quarters. There will be losses by Hyundai Merchant Marine, Ocean Network Express, and Yang Ming; for those who pay close attention, look at the details of the Cosco Shipping report with several notes on subsidies being injected into the profit and loss stream. While these events took place, so did the continuation of deteriorating services, with recent reports on reli- ability hitting 40 percent for some, with a high of only 72 percent. Some of that results from heavy trans- Pacific utilization and relatively poor terminal productivity on the US West Coast impacting the entire system, with no increased vessel speeds to make up some of the lost time because of high fuel costs with little recovery in place. The other significant events relate to the push for advanced technology, with some carriers reaching to provide end-to-end services. On the tech- nology side, blockchain has gained better understanding — it isn't the silver bullet to solve all supply chain or container shipping ills. And there are significant issues with the lack of standards in devel- opment, etc., and so many entities creating their own "best solution." It is a work in progress with some difficult hurdles. Carriers have yet to address that the input will be coming from a multitude of sources, with many relying on inefficient and ineffective underlying systems to feed the "blockchain." I believe in five to 10 years there should be systems to cover all entities who must be involved in a complete supply chain or a complete interna- tional shipment. For those who think that is a long time to be completed, consider that the largest carrier in the world was fully digitized internally by 1996, yet we see many articles today on the requirement to digitize. Another work in progress in the end-to-end services some carriers desire. It's been done before with varying degrees of success — and fail - ure. Will this effort prove any more successful? Be patient. From the vantage point of late November, 2018 will be a mixed bag of near disaster, continuing frustrations, and some glimmer of hope; it all depends on your position and perspective. For carriers, in like a lamb and out like a … who knows? For shippers, if you had friendly service contracts, you avoided the fuel surcharges and much higher spot rates — up to the point of your minimum quantity commitment. If not, well, you likely depended on your friendly freight forwarder, non-vessel-operating common carrier, or 3PL and got some shocking increases along the way, with perhaps your cargo rolled a few times. All cargo was subject to the poor reliability, with high-volume service contract signatories getting better access to space and equipment. 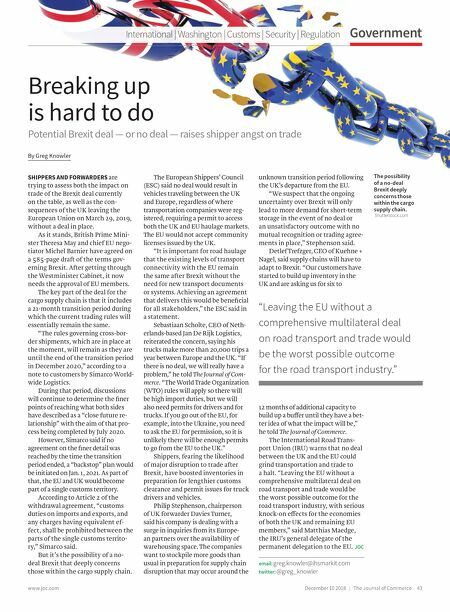 Looking to the future, many unknowns still exist, including the ongoing drama involving trade agreements. Agriculture exporters in the US were hit especially hard in 2018. Will that get better or worse? Imports are reported to be strong because of the increases in duties coming in January, but then what happens? Will the bottom drop out? Or will the negotiations mitigate the negatives? I wish all of you a happy and healthy holiday season. JOC Gary Ferrulli is chief executive officer of Global Logistics & Transport Consulting. Contact him at gferrulli@ globallogisticsandtransport.com. 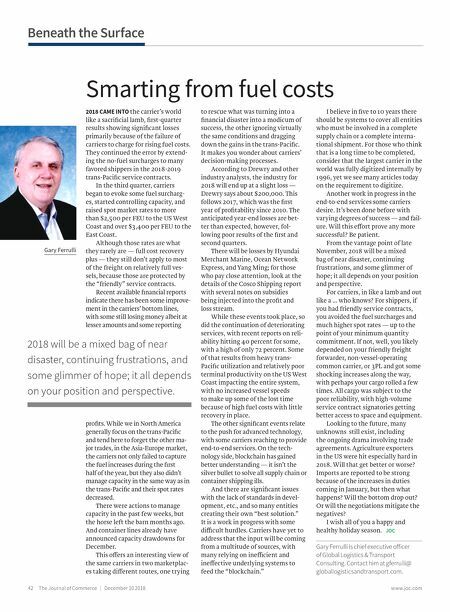 Smarting from fuel costs 2018 will be a mixed bag of near disaster, continuing frustrations, and some glimmer of hope; it all depends on your position and perspective.